Curious to see if Sev also ends up there, as has been hinted at in the past, but probably not. Be ash and cinder forevermore! DakkaDakka | Where you thank the mods for baning you! Oooh, big big big interest in this book now! A lot of people always presumed that several of the Knight-Errants went on to found the Grey Knights, however, this implies that that is not the case! We also always heard that there were 8 founders, but, again, this leads us to believe there was Janus/Ianius and then 8 additional Grand Masters severing below him. Super interested in what we learn from all this! Intrigued to read this one. But I’m not sure I follow you, why does this imply that they don’t go on to form the Grey Knights? As in they may not make it through the book? Or something else? Also again the 8 founders thing, does this give us more info on that? What have I missed. Well, it's more the fact that "the 9" are listed as separate characters in the character list. Now, there is no way of fully saying whether or not halfway through the story they “kill off” 1 name and convert them to another name. 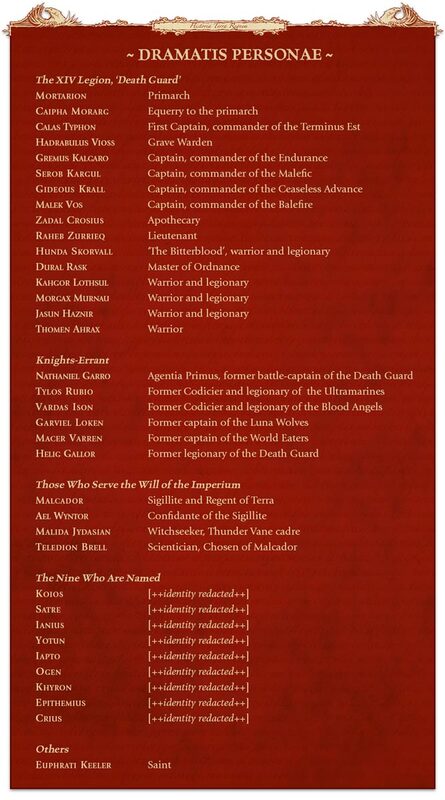 We know the Grand Masters are all psykers, along with the entire chapter, so, unless some miracle style thing happens and all the Errants suddenly gain psychic powers from somewhere, then, it really does lead to the idea that these 9 characters are separate. That said, some of the “unnamed” Knights Errant that are in the background could be ones that go on to for the Grey Knights, but, I think the fan favourite idea of it being Loken, Garro etc etc is less likely now. It simply gives us the chosen/given names of the 1st Supreme Grand Master and the 8 Company Grand Masters. All previous noted canon that I’ve come across has always stated that there were only 8 founders. This however implies that there were 9. Ah yeah, I was concentrating on the ones mentioned in KNights Errant rather than the 9. Wasn’t there also a thing about those who formed the Inquisition itself, and Garro/Loken could be those, along with Snydermann or whoever else is still about to do it now. Not sure that works though actually, as wasn’t the story that the humans split off to do the =][= and the marines formed the GK..
Well time will tell I suppose.. I really wanted to buy this at the HHW but the large hardcover put me off, well, that and the fact I'd already made my bank account almost £200 lighter already. gonna wait for it in paperback I think. Heresy World Eaters/Night Lords Genestealer cults. How many of the names do we know already. isn’t he the GK in Pandora’s who has been there for 10,000 years? Khyron mainly from the speculation regarding who he could have been and his broken/defaced statue. Epithermius is the one on Pythos, and Janus is simply noted in several places as the first Supreme GM. As for the rest, I don’t think there are any/many known references to them at all. I hope they follow through with who Janus is rumored to be! Just got an update that my Inferno reprints part 2 (6,7,8,9,10) are being posted! So chances are that others will start getting notifications soon too! Same here, hopefully have them in hand next Monday or Tuesday, dying to read both them and Inferno! 2 now. What’s The Death Of Uriel Ventris all about, and has anyone read it? From what I've gathered elsewhere..
One would think Cato would be up first for this but oh well. If algae farm paste with a little bit of your grandfather in it isn't Grimdark I don't know what is. In just over a week, the Black Library Celebration will see stores worldwide running events based on the adrenaline-fuelled fiction of Warhammer. Of course, the event will see piles of new books released, as well as a miniature based on Severina Raine, the hero of one of the new titles. Peachy and Duncan got so excited about it all that they went and made a video so they could get the books early… Give it a watch now. Check back from next Monday, as we look at what’s coming for the Celebration in greater depth with a new article – and a new eBook short story – every day. Until then, find your local store and see what they have planned for their Black Library Celebration day. Duncan always reminds me of a young Tom Baker when he's all goggle-eyed and enthusiastic about stuff. "The place they go towards is a place even less imaginable to most of us than the city of happiness. I cannot describe it at all. It is possible it does not exist. But they seem to know where they are going, the ones who walk away from Omelas." Thanks for the link, I was on the fence about Hamilcar as it felt too much like Cain, but I may just pick it up now after reading that synopsis. does she look better in this angle? She's lovely, can't wait to get two of that mini. Wrapped up Inferno! #2 and it's another winner, no duds in this one. Personal favourites are The Merchant’s Tale and No Honour Among Vermin, we need more of C. L. Werner's Skaven stuff! I really enjoyed this heist story. I've not been to one anything like this for many, many years and I know it's a pretty small thing really, but are those coasters likely the only non-book exclusive thing that'll be available? I'm not sure if that's the only thing there will be or if they don't usually announce it all. If there was anything else they'd announce it, I was hoping for more myself, but alas, that's it along with the sketchbook. 6 eBook short stories for the price of 5! From the trials faced by newly-discovered primarchs to moments of quiet in the midst of battle and the dark path walked by the Blood Angels' Redeemer of the Lost, six brand-new short stories from the Horus Heresy and Warhammer 40,000 are the perfect lead-in to the 2019 Black Library Celebration. Three of these tales are great tie-ins to the fantastic new books premiering for the Black Library Celebration – The Buried Dagger, Angron: Slave of Nuceria and Honourbound – and the other three are intriguing stories that widen the worlds of the 31st and 41st Millennia. Celebrate the adrenaline-fuelled fiction of Black Library – and the galaxy-spanning series that is the Horus Heresy – with six brand-new short stories released over the course of the week, including three from the Age of Darkness. Across these tales, you will discover secrets of Mortarion and Angron from around the time they were brought into the Imperium, see what lengths Arkhan Land will go to for those he almost considers friends, and witness a moment of quiet comradeship between Commissar Severina Raine and one of her troopers. You'll also experience the horrors Astorath of the Blood Angels faces as he brings peace to a fallen battle-brother, and discover how the birth of the Great Rift brought Chaos to the great dynasties of the Imperium. This subscription includes 6 eBook Quick Reads in ePub and mobi formats. Each day between Monday and Saturday, a new title will be added to the subscription zip file in your Black Library account, ready for you to download. If you subscribe partway through the week, all released stories will be made immediately available, with the remaining stories being added to your zip file each day. For more information on downloading and opening zip files, please refer to our Help pages. The webway war is over, the Blood Angels have arrived on Terra and preparations for the final battle have begun. But can Arkhan Land solve a problem and fix the issues that stop the Blood Angel Zephon from fighting alongside his brothers once more? The deliciously amoral tech-priest Arkhan Land was one of the highlights of The Master of Mankind, and this story delves further into exactly what he's willing to do in order to solve a tricky problem – and what consequences can arise from his actions. At the height of the Webway War, renowned Mechanicum technoarchaeologist Arkhan Land ventured into that alien labyrinth in defence of the Imperium. At his side was a wounded warrior of the Blood Angels, Zephon. Now, Land faces a great challenge – to repair the damage done to Zephon, partly as a result of the tech-priest's own tinkering. But how can Land succeed where the greatest of Apothecaries have failed? And when all is done, will the only person the tech-priest comes close to calling friend still be the same man? I'm sure some of those are already in this year's event only Black Library hardback? The Commissar story you mean? Probably yes, I vaguely remember the author stating that she wrote one more short story as a prequel to the novel, which would be in the event book. Could be them doing it both digitally and in dead tree format, though the latter will be free with any purchase that weekend. What's the titles of the short stories in the Celebration book as that appears to be a completely different book? Eyup, the Darkling Hour is the one that will be featured in the upcoming event book, as per tweet of the author. Looking forward to that one, it's probably another instance of Severina sitting down with Andren to talk about legends and myths from Antar. A message from a distant cousin sets Viola von Castellan – backed by the authority of Inquisitor Covenant – on the trail of a mysterious cartel with murky motives. It's a fascinating look into the post-Gathering Storm Imperium, and told in a very different way – through a series of communications and reports making up an Inquisition case file. 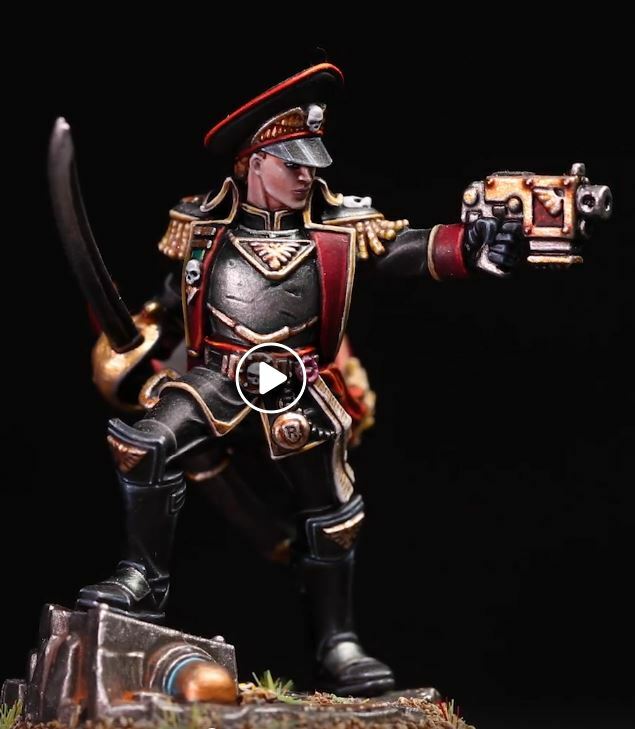 Among the companions of Inquisitor Covenant are scions of the famed von Castellan dynasty, a mercantile clan with links to many other such families throughout the Imperium. When a member of one such family reaches out to Viola von Castellan with a tale of woe that began with the dawning of the Great Rift, an investigation begins into the mysterious Cytos Cartel, an organisation that has wormed its way into the heart of the Imperium – but to what sinister purpose? After a year in the Imperium, Mortarion has yet to lead his sons in battle – and is still unsure of his place in this galactic empire. Will a meeting with the Emperor ease his doubts, or harden his distaste for his new situation? Mortarion's early years are fascinating, and this tale not only delves into his deepest doubts and fears, and sows the seeds of his later treachery, but also shows how difficult his relationship with the Emperor was from the very beginning – and how he came by his infamous pistol, the Lantern. One year after the coming of the Emperor to Barbarus, Mortarion and his Legion – the newly renamed Death Guard – have yet to strike out and join the Great Crusade. The primarch is wracked with doubts about his place in this Imperium of Man, and still angry that the Emperor robbed him of his vengeance against the alien father who raised and tortured him. When he is summoned to attend the Emperor on his flagship, will his resentment spill out and threaten the relationship between them? Or will the Deathlord master his emotions and embrace the Emperor's light? I do like 'early Primarch' stuff, Great Crusade era, before it all went so spectacularly wrong (or is it 'All According to Plan'?!?). Ehhhhh, depends on the author I suppose. I am forever grateful that they let Chris write the White Scars Primarch novel.